Today, this was my completely impulsive grocery store purchase. 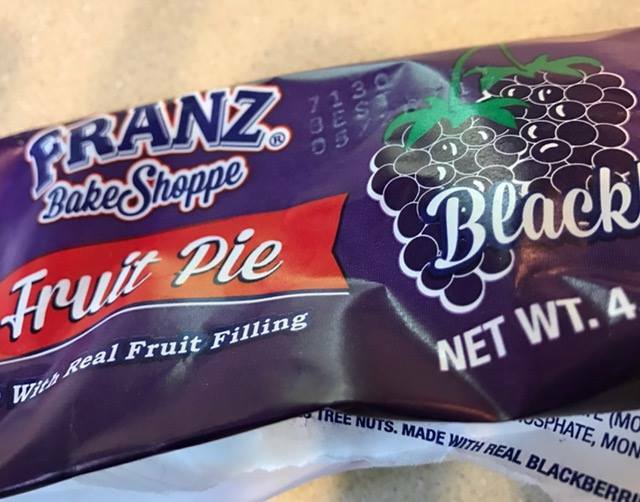 I hadn’t eaten one of these fruit pies in decades. Maybe I was feeling a bit nostalgic, with my youngest daughter set to graduate high school next month and my son recently moved to New York City to start a fancy-pants job at Sports Illustrated. Transitions, time passing, mortality musings–you know, all those slippery slopes we navigate if we’re lucky enough to live this long. I bought just one, even though I think they were ridiculously priced at three for a dollar or something like that. I didn’t read the nutritional label because I already knew there was nothing redeeming there. Once home, I broke a little corner piece off the end and watched the thick, purple filling seep out of its pastry shell. A lovely, deep, eggplanty shade of fruity ooze. I took a bite and was surprised at how identical it tasted to my memory of it. It was perfect. I thought of my best friend in junior high. Kathy Peterson’s house was always stocked with boxes and boxes of delicious treats. After school snacks at Kathy’s usually meant crunchy, old-fashioned donuts from the day-old bakery shop across from the bowling alley. Hostess pies, Ding-Dongs and Twinkies lined the shelves of her garage pantry. Also, she had a garage pantry! All of this seemed magical to me. I lived in a home where nearly everything was made from scratch–it was cheaper and more economical back then and we didn’t have the budget for such extravagancies. I coveted those glamorous, brightly-wrapped, over-processed, sweeter-than-sweet delicacies as if they were the finest European confections. Of course, I was devastated and confused and heartbroken as only a freshly dumped 14-year-old girl would be. Kathy and I never spoke again and I never learned exactly why she couldn’t be my friend any longer. I imagined it was because of my weird brother or I had mistakenly shorted her of her half of our newspaper delivery collections or I just wasn’t cool enough. Or maybe our metabolisms simply weren’t compatible. I hear that happens sometimes. And you know, it turned out okay in the end. I grew up to learn that Hostess pies and cupcakes generally sucked compared to homemade ones. I grew to appreciate my own strange family living without a garage pantry. I learned a few choice words written on a note and left in a locker can change a life, eventually for the better. And today I understand that a seemingly random blackberry pie, impulsively added to a grocery cart on a Friday morning can be more than just a nutritionally deficient lunch: it can also be a delicious portal to the past.